While BOWA has been doing condo renovations for more than two decades, this sector has been steadily increasing as a percentage of our work in recent years. Currently, condominium remodeling represents about 20 percent of our yearly projects. Given the highly specialized nature of this work and all signs indicating that demand will continue to increase, BOWA has officially launched a new Condo Division focused on growing this portion of the business. Leading BOWA’s new Condo Division will be Adam Wertheimer as Vice President, and Steve Kirstein, Principal. These two have led most of our condo projects over the years and have developed a niche expertise and invaluable relationships while doing so. 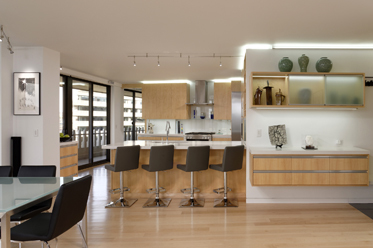 BOWA’s condominium projects range from kitchens and baths to whole-unit and combined-unit renovations, in buildings from DC to Reston and Chevy Chase to Alexandria. The team has established relationships with management, boards, clients and residents in more than 33 high-end buildings, including many of the region’s most distinguished addresses. Wertheimer and Kirstein will be supported in their efforts by a team of design professionals, production experts, subcontractors, realtors and other partners who are all well-versed in the intricacies of this type of work. Our architects and designers understand the nuances of condo design, such as optimizing space, creating storage solutions, ensuring privacy, tricks to help clients transition from single family home living and more. BOWA Condo Project Managers understand that complex commercial building systems require specialized subcontractors and the watchful supervision for which BOWA is known. Condo specialist realtor partners understand the importance and value of being able to quickly and thoroughly evaluate options when units become available. The BOWA team works together seamlessly to ensure that each condo project delivers a positive remodeling experience for the client and quality, beauty and functionality that are unsurpassed. To learn more about BOWA’s condominium remodeling projects and services, visit https://bowa.com/condo.